Roadtrek has been a leader in the Class B motorhome industry for over 21 years and named the best-selling Class B motorhome in North America. So it is not uprising that the manufacturer provides a Class B motorhome that boasts more space and efficient engineering. That’s what you’ll find with Roadtrek’s 2013 210-Popular; design, engineering and functionality. Built on a Chevrolet Express 3500 widebody extended van, it has a 6.0L V-8 Engine. The body is made of a fully painted design and steel-cage-reinforced fiberglass. The 155-inch wheelbase provides a smooth ride and easy handling; not surprising as Roadtrek rates high when it comes to performance. Roadtrek started with a full van body and extended the frame 18” behind the rear wheels increasing the overall length to 21’ 11”. Roadtrek Co-chairman Jeff Hanemaayer said owners report getting around 15 mpg on the highway. The 210 Popular has 74 inches of headroom, a fully enclosed, private bathroom, a GPS navigation system, iPod and Bluetooth phone interfaces, a backup camera with remote , dash AM/FM satellite radio and CD, MP3 and DVD players. It features an amazing amount of storage, 74 cubic feet. The Popular has a 120-volt AC Dometic air conditioner and heat pump, box awning for entertaining ,faux leather seating for five, granite countertops, stainless steel sink, recessed two-burner stove with flush cover, a microwave/convection oven and 5-cubic-foot refrigerator. The 210 has leather captain seats in the cab, seats 2 to 5, and sleeps 2 to 3 in a front single and a king-size bed. Rear twins are an option in place of the king size bed. The 210 Popular can be found with a MSRP of $100,945; when fully loaded the MSRP starts at just over $110,000. 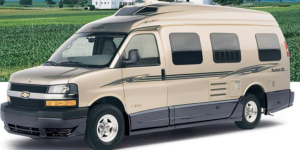 To find more information, reviews and ratings about this best-selling Class B motorhome manufacturer, purchase our Motorhome Comparison Guide now.